Quad Close Trap Device New Packaging - Jay R. Smith MFG Co.
Jay R. Smith Mfg. Co. ® announces the unveiling of a new and attractive design in its branding with fresh product packaging. 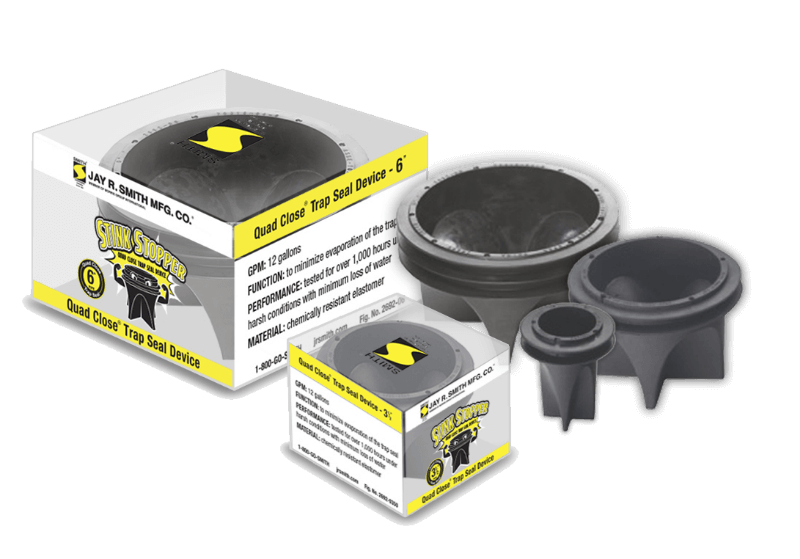 The new design is a more innovative look for the Quad Close Trap Seal ® (Sink Stopper) product that will be easily recognizable and distinguishable from competing products. Also, unique with the breakthrough design is that the Quad Close Trap Seal (Stink Stopper) packaging has a contemporary look-and-feel which is a significant improvement over the old packaging style. Other eye-opening features include the Jay R. Smith Mfg. Co. brand name being more dominant on the top, front and sides of all packaging, reflecting the superior Smith ® identity and performance associated with its products. Jay R. Smith Mfg. Co. is excited to help steward a new era of innovation, excitement and sustained growth for its family of products. Jay R. Smith Mfg. Co.’s Quad Close Trap Seal Device also comes in new packaging which allows for easy display both on the wall and on a shelf—perfect for both wholesalers or distributors. Stay connected with Jay R. Smith Mfg. Co. ®. Like us at Facebook.com/JayRSmithMfgCo or connect on Twitter @jrsmithmfgco.